NEW! 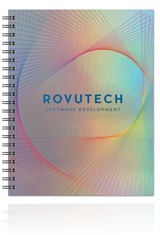 Glossy, holographic paperboard front cover with black paperboard back cover. Includes 1-color foil or blind deboss up to 16" sq. 100 sheets of lined paper. Black wire is standard; also available in white, bronze and pewter. NEW! Choose from WireBound or PerfectBound journals in a cover material that is sure to captivate its user. Holographic Rainbow PerfectBooks include flexible, wraparound paper covers, 100 sheets of ruled paper and a perfect-bound spine. 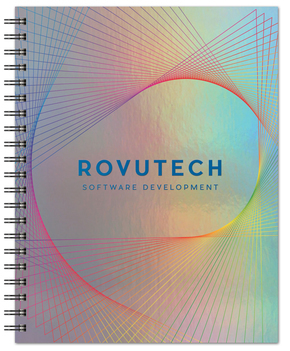 Holographic Rainbow WireBound journals include a black paperboard back cover, 100 sheets of lined filler and standard Black wire. Call for higher quantities. Price includes 1-color foil imprint up to 16" sq. Standard turnaround 7-10 business days. Setup is $52.50 G. Pre-production sample available for $52.50 G.